Annette Funicello, one of the original Mouseketeers of the 1950s Mickey Mouse Club and a star of numerous 1960s “beach party” films, died Monday at the age of 70, the Walt Disney Co. announced. Annette Funicello “died peacefully from complications due to multiple sclerosis, a disease she battled for over 25 years,” at a California hospital, the Disney statement said. “We are so sorry to lose Mother,” her three children said in a statement. 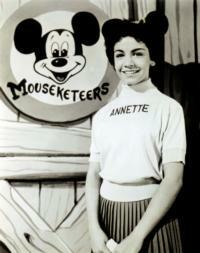 Annette Funicello was just 13 when she was selected by Walt Disney himself to be one of the original Mouseketeers of the Mickey Mouse Club, the 1950s television variety show aimed at children. She had a background in dance and quickly became one of the most popular Mouseketeers. Annette Funicello “was and always will be a cherished member of the Disney family, synonymous with the word Mouseketeer, and a true Disney Legend”, Disney chairman and CEO Bob Iger said. She remained with Disney after leaving the “Mickey Mouse Club,” appearing in TV shows including Zorro (1957), The Nine Lives of Elfego Baca (1958) and starring in the Disney feature films The Shaggy Dog (1959), Babes in Toyland (1961), The Misadventures of Merlin Jones (1964) and The Monkey’s Uncle (1965). The most enduring images of Annette Funicello, though, may be of her in a bikini, her primary wardrobe when she co-starred with teen idol Frankie Avalon in beach party movies in the early 1960s. Walt Disney saw Annette Funicello dancing the lead in Swan Lake at the Starlight Bowl in Burbank when she was 13. Disney asked her to audition for a new children’s TV series he was developing called The Mickey Mouse Club.